A pedometer measures in real time the number of steps a person takes. Medical use includes encouraging patients to be more active, for example in the context of a diet and exercise program for an overweight person. 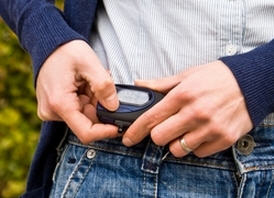 Some pedometers are equipped with a calorie counter. Others use two- or three-axis sensors to improve accuracy, allowing them to be worn on the belt, the wrist, around the neck or carried in a pocket or bag. Choice depends on specific intended use, for example for walking or for racing.